Big Hydraulic Swim Step offshore? We are looking at a '07 Norseman 560. It will be our liveaboard home in San Diego. We would like to take it as far north as San Francisco and south into the Sea of Cortez for a season or two. I've attached a picture of the boat. We are very experienced long distance sailors. We've done Seattle - San Diego four times, Annapolis - BVI, San Diego - Acapulco and back twice and lived aboard in the Sea of Cortez for three years. We know a lot about sailboats in big following seas but NOTHING about a power boat in the same conditions. How will that 6' wide swim step, just a foot from the sea surface, do when headed down wind in 6' - 8' short steep waves that are so common headed SSE from San Francisco all the way to Cabo San Lucas? The current owner has cruised from San Diego to Puerto Vallarta and back several times as well as several trips to Monterrey and back so it seems like the boat will work for what we want. The boat has NO provision for lifting the dinghy to the boat deck and there is no room up there for a real cruisers dinghy, so it has to ride on that swim step. That idea scared the bejesus out of me - but maybe that is just my old sailboater self. We will never be more than 25 miles offshore, except when crossing the Sea of Cortez, but there are a lot of stretches of water along the Baja West Coast where no safe harbor is available. How do people cruise in bigger water with this kind of boat? I think you are right to be concerned, but alarmed? Don't know. For big water stages could that big step be modified to fold up against the transom? Then tow the dingy on a long rope. This is not going to be a problem for coastal cruising in reasonable weather conditions. A huge percentage, I'll say most by far recreational power boats operating in coastal areas have swim steps. Allot of these boats have their skiff on the swim step. Yes, some waves go over the swim step. Most go underneath, lifting the aft of the boat with them. If it's mounted correctly you should be ok, so check all mounting bolts. If it rips off you are in some serious waves. I've only seen two ripped off and they were both sea rays one crossing back from the Bahamas and one crossing in the Gulf of Mexico. The one in the gulf was delaminated glass and ripped from the platform not the mount. What brand of hydraulic swim platform is it? We have a 52 ft Jefferson with one on it. Crossed the gulf and at one point had six footers but they were on our forward quarter. Just had a little water in the dinghy and the lift did fine. Swells were a good period apart. In Tampa bay we had 25 to 30 knots on the stern with short period rollers (we were not expecting that). Waves went over the dinghy and filled it up even though both drains were out on the dinghy. It really kicked our tail so to speak. The dinghy definitely moved on the lift filling the dink was my worst fear. In both cases the lift did fine although I was concerned. The lift was installed by Florida Bow Thrusters and they reinforced the back with 3/4 fiberglass and tie back aluminum 2 inch straps to the stringers. I checked everything after both issues and all was well with the mounting. I definitely would watch you weather openings but swells that were spaced far apart did not give us any issues. One other point, they did install the lift higher than most per my request. About 18 inches above the water. You've a right to be concerned about a dinghy on the swim step for Pacific west coast cruising. You are in the right place to get your questions answered. The SYC and Fubar organizers have developed power boat safety criteria for the waters you wish to "newly cruise." See what they have to say. Amazing how many sport fish designs have their dinghy on the foredeck. The Aussie designs seem to have perfected this with sturdy lifts and cradles affixed. In the sail boat community how many leave their dinghy stern davits bare for offshore cruising? My experience was we deflated and deck lashed. Tacoma; IMHO it's like asking if you should have insurance - in your heart of hearts you already know the answer. You have a nice big foredeck. Install a Marquipt hydraulic davit with pad-eyes and cradle up there. Use it when you need it. BTW: If you do this, (i) get power-swing and (ii) mount all the electrics below decks, not in the crane body. Use stainless wire and over-center latches, not webbing. How well does the boat do with following seas to start with? Then add the dinghy and platform. Height is an issue. But not just height sitting, height while underway at the speeds you would be going. I avoided dinghy's on swim platforms until our most recent boat. On it, the platform raises much higher than the one in your photo. The boat also stays high in the stern, doesn't dip deep when underway. Still 6-8' following seas would hit it but it's also very well secured. Immediately after purchase we added additional securing for the dinghy, basically doubling. You double lines for a hurricane so definitely do so for a platform dinghy and rough seas. There are davits available that would be independent of the platform and further raise the tender, then allow you to lower it to the platform and use the platform for launching it. We installed a large hydraulic swim platform on our GB46, lifting capacity of 500kg and tied all the way back through to the hull stringers with two very large and heavy custom metal brackets. I think it would be sensible to check that the platform on your proposed boat is tied back to the hull stringers, not just bolted onto the transom. As others have mentioned, you could get a crane put on the foredeck of your proposed boat and stow the tender there when at sea. Heaps of Aussies have that configuration on Rivieras and Maritimos, mostly using the local crane brands here: Davao and ADC - both have websites showing this solution. Another option, again as others mention, is to modify your hydraulic lift so that it lifts up much higher than it currently does. Finally, in a following sea the transom on our boat does fine (without the tender on it). It get very wet, but that's about it, and it is very securely attached. You will do just fine. We have been from S.F. to the Columbia River Bar and then to Skagway Alaska and back via the inside passage which also includes a 190 mile run of open ocean from the Bar to Cape Flattery. Alaska SeaDeduction - that is a lot of tough miles in conditions I know well. We've been around Vancouver Island and did Neah Bay to Cape Scott and back (on the outside both directions) just to have the experience (1999). Did you carry the dinghy on the swim step? Did you encounter any tidal overfalls on the inside? Even in the Sea of Cortez I've seen 6' water haystacks that suddenly collapse when big tides meet big changes in the bottom. Our 40' sailboat was pooped by such an overfall on a beautiful clear day with not a whitecap in sight. Those big mounds of falling water seem like they would be a real hazard if they broke over and into a dinghy on the swim step. They filled our wide, deep cockpit even though we have three large scuppers. The next day I found salt water inside a 5-quart pot that was on the 2nd shelf above the floor in the galley at the bottom of the companionway steps. I also found saltwater inside my nav station desk. The only time I didn't carry the dinghy was on the outside from Columbia River Bar to Neah Bay and back the other way. It was on the back across Cape caution and Dixon Entrance. Cape Caution was the worse. The cover kept the water out of the dink. Big breaking swells and no worries. Tacomasailor, my eye detected vacant foredeck real estate. It could interfere with existing hatches and vents, and vision, so may not be feasible, but worth considering. Very common on Rivieras. I've got one of those 'very common Rivieras' (gee thanks Bruce ). Firstly - our swim step (duckboard) isn't hydraulic but we've never had an issue with following seas. And we've had our share of tall, short and sharp seas boating the waters of Hervey Bay and north to Gladstone over the last few years. Secondly - We've got the tender on the front with a folding davco davitt - only problem with this for us is - due to boat size - we have to take motor off the tender to fit it on the front. Bit of a fiddle around setting up and taking down but pon the whole - not too much hastle. 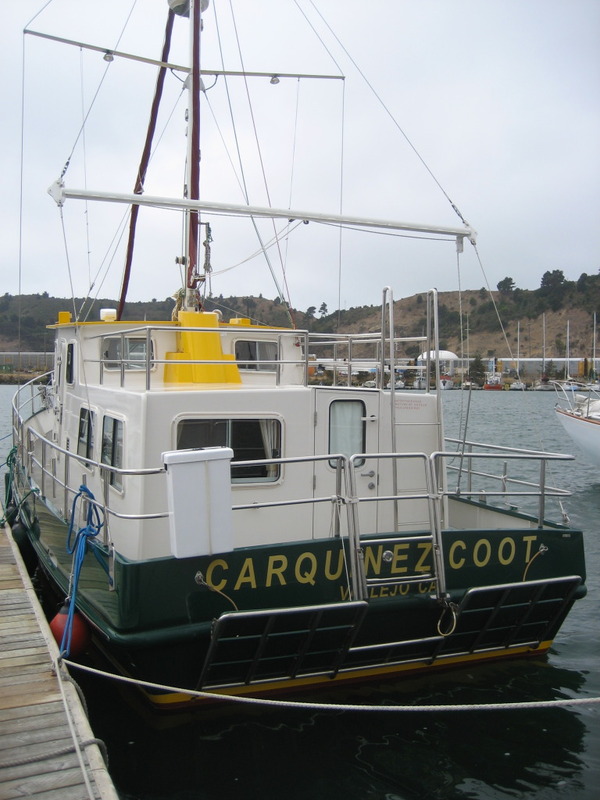 Tender sits snug and secure on the foredeck tied in her cradle. The cradle lifts the tender up enough so that top hatches are not obstructed. So on the west coast who makes hyd swim platforms? I'm supprised regular swim steps don't seem to cause many problems. They may on FD boats because they are so slow but others may be able to go just a tad faster than most all stern seas. It's in the same catergory as negative rake transoms. Could cause problems or even a swamping but obviously dosn't happen very often. Is it good design? No .. IMO. But most would probably go for it even after considerable research. Always operate my boat with the platform raised/folded.